In 1917 a ceramic urinal was tipped on its side, signed R. Mutt, and anonymously submitted to the art exhibition of the Society of Indepen­dent Artists. Later, one of the Society’s members, the esteemed Dadaist Marcel Duchamp, would lay claim to the act. Though the Independents promised to display all work submitted, when the test of their resolve came, they couldn’t accept the urinal as art. In retrospect, this seemingly modest act of artistic anarchism was a momentous event, one that forever altered how we define art. Henceforth, as Duchamp put it, “An ordinary object [could be] elevated to the dignity of a work of art by the mere choice of an artist.” Critics have called Fountain, as the urinal was titled, the “most influential artwork of the 20th century.” This icon of modernism was never exhibited, seen only by a handful of people, and then lost, likely thrown away. A single photograph is all that exists today. Perhaps no other work of art has been subjected to more documentation and scholarly analysis, including challenges to its authorship. But the story doesn’t end there. In the 1950s and 1960s, at the dawn of the pop art movement, as Duchamp’s ascendance into the pantheon of art gods was gaining speed, he commissioned 17 Fountain reproductions that can now be found in museums around the world. These are essentially pricey commemorative mementos of a piquant act decades earlier that signaled a seismic shift in the tectonic plates of the art world. They are widely revered as near-sacred objects. Keep all this in mind when you visit Ne Plus Ultra, a 10-year survey of the art of Michael Beam, now on view at Big Orbit Gallery. Beam makes droll use of a broad range of Dada stunts, including enlisting a sequin-jacketed actor to speak at the exhibition’s opening reception—in French. The actor then oversaw a free raffle of three artworks on display, and gave away two bowties from a company Beam invented, followed by a Champagne toast. It was theater of the absurd ripped from the Dada playbook. Much of the painting, assemblage, and mixed media on display involve appropriated images or found objects, what Duchamp would call “assisted readymades.” Some are grin inducers, such as the assemblage titled Work, comprised of a silver squirrel-shaped nutcracker, surrounded by an assortment of nuts, encased in an elaborately-engineered glass box. This sits incongruously atop a book titled Bonaparte. Down the front of the box in black lettering is the word “work.” Like all of Beam’s art, this is open to a variety of interpretations and associations. The squirrel has his work cut out for him. Is he a metaphor for the resolute ambition of Bonaparte? Does a nutcracker make work easier? It’s a head-scratching game of 20 questions that’s played out many times throughout the exhibition. Beam isn’t just mimicking early 20th-century Dadaist absurdity using updated images and objects. He ladles on another rich layer of meaning that speaks to the act of presenting art itself. It helps to know that Beam is the Curator of Exhibitions and Collections at the Castellani Museum at Niagara University. Much of his daily life revolves around establishing provenance, cataloging, conserving, and displaying art. Each of the works in Ne Plus Ultra is exhaustively and often amusingly documented in explanatory text panels. Language Weaver and Machine Translation Algorithms, for instance, is comprised of bits of confetti-like paper sandwiched between ornately framed glass sheets, topped with a picture light. Printed on the glass is the absurdist phrase, “the vodka is good but the meat is rotten.” The tag tells us that the confetti is actually several shredded artworks, the anarchistic antithesis of art conservation. Significantly, we are not told why the works were chosen, who made them, or what they looked like. Rather, with deadpan museum professionalism, Beam lists the make and model of the shredder, along with the specific brand of paints, paper, and other art materials in the shredded artworks. Then he describes Language Weaver, a corporation with ties to the CIA (an organization not unfamiliar with paper shredding) that produces translation software. Beam recounts an apocryphal story of a humorous software mistranslation that produced the Dada-worthy phrase on the front of the work. And so it goes in a succession of interconnecting Venn diagrammatic circles that fall just short of connecting everything to Kevin Bacon. To Beam an act of culture is an act of culture. No matter how seemingly insignificant or mundane, items of cultural interest merit the same reverential conservation and documentation as Duchamp’s Fountain replicas. In one untitled work, a “Gelatinous mass of coagulated cheese ‘powercoating’ found in a 32oz. Utz CheeseBalls container” has been elegantly encased in epoxy. The epoxy ingot looks a bit like a slender bar of yellow soap. It’s signed and dated, marked 1.8 ounce, and lovingly displayed on a custom faux leopard fur salver. Every ingredient of the processed snack is listed on the tag, along with the specific product code. This is all contained within a glass display case next to a series of four similar epoxy-coated gelatinous masses made to look like Bazooka Brand Ring Pops, complete with their own crystal display cubes. This meticulous detailing highlights another salient point about Beam’s art; all this stuff looks great. The slick presentation imbues the work with feigned gravitas and genuine bling. At times the work glitters with—well—glitter. Michicolated House 1726 (French Castle for JPCEONTCC) is a shaped canvas, the contours of which are based on an early plan for what would become known as the French Castle at Old Fort Niagara in Youngstown, NY. It’s one of several works relating to local history. The surface is an abstract camouflage pattern made of colorful glitter, then coated in thick epoxy. Fort Niagara’s French Castle is a massive military fortification that the French originally described to the Iroquois as a trading post, misleadingly naming it “House of Peace.” Glittery camouflage indeed. While much of the work demands this sort of viewer conjecture, sometimes Beam curiously spells out his intent, as with the large painting Kuru — Basura. The wall text identifies the work’s appropriated cartoon sources, the meaning and origins of the title, and the artist’s reason for painting it. It’s as if curator Beam feels compelled to guide viewers through the workings of artist Beam’s mind. Not that all this elucidation diminishes this delightfully quirky work any, but it takes some of the mystery out of it. Other notable works include two clear epoxy boxes with food sealed inside without oxygen. As the food slowly decomposes, Beam documents the process. The science fair vibe is enhanced by hyper-detailed documentation and an ersatz museum presentation. One untitled work utilizes custom tinted Home Depot paint, to match a detail in a Frederic Edwin Church painting of Niagara Falls. A large canvas is nearly completely covered in the dark color, and then sealed under a thick epoxy coating. White letters across the work wistfully spell out, “I can’t paint like I used to. 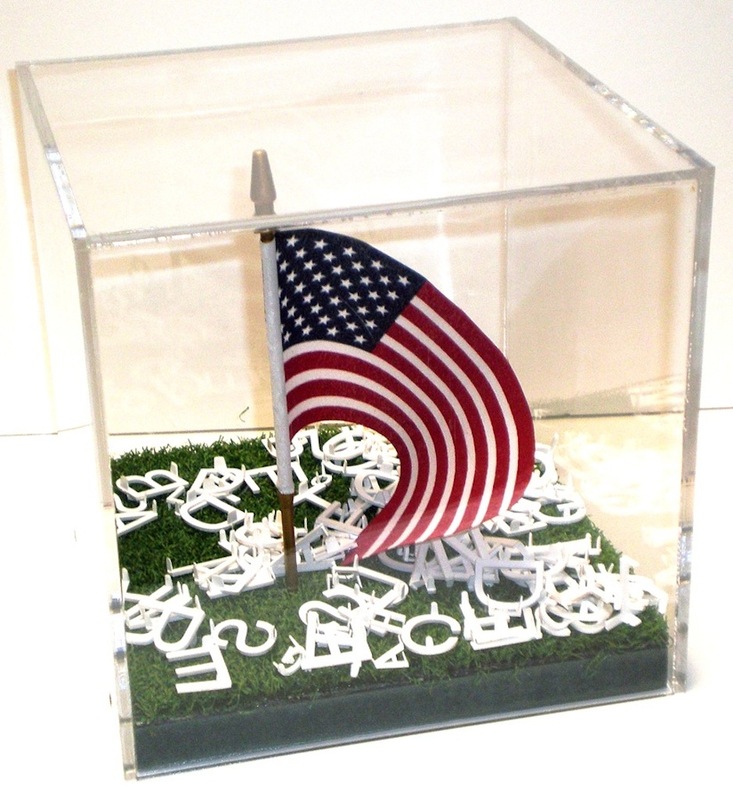 It frustrates me.” Untitled (The Pledge of Allegiance) is another acrylic cube containing a bit of Astroturf, a miniature American flag, and a number of white plastic letters scattered randomly inside. One imagines that the letters could spell the pledge, but who knows? Beam’s work resonates with viewers due to its familiarity. Everything here reminds us of something we know or have experienced. Not everything is equally effective, but there’s plenty to entertain and occupy the curious mind. Duchamp would be amused.